Did anyone notice that it seemed as if Marquez wasn't as aggressive as he was against THE LEGEND in Valencia? (Sarcasm intended). I think the *** is still drying on Marquez's mouth when he handed the title over to that weasel Lorenzo. What a joke MotoGP officials. It frankly is disgusting. I'm glad that Hayley is coming back to WSB. Maybe Rossi should consider leaving MotoGP and cross the pond over to the U.S.. 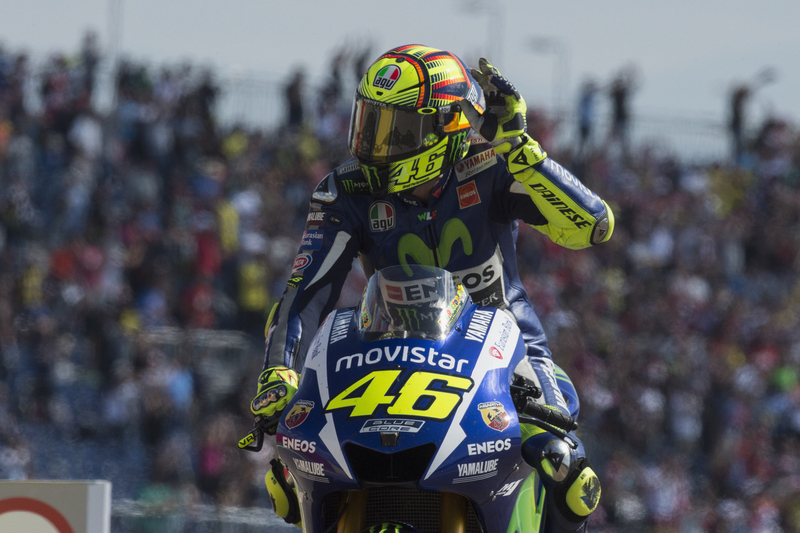 Brilliant riding today Rossi. You have shown with high decree why you have been labeled a true legend. Bravissimo...! I guess it's a shame that Lorenzo is almost always faster than Rossi on the same equipment. Rossi screwed himself with his stupid move at Sepang. It's likely he would have won the title if he had just focused on the championship. Rossi showed once again why he's a true legend and may have formally lost this championship but he still has 9. You only have ONE dignity, and Lorenzo/Marquez lost it once for all. Rossi still the best, just wished he had a bit less distance to cover, Yamaha's are just too slow on the straights. I'm a Rossi fan but the truth is that he is simply not as fast as Lorenzo except in the wet. True, but they don't give championships to the "fastest guy". Just the one who wins the most points. It is a hollow and almost fake victory for Jorge. Marquez is a lowlife who did nothing but do dangerous moves and bash into Rossi until he was infuriated. If you watch the vid, Marc rammed Vale just before he crashed. It should've been a racing incident and let the racing decide. The whole thing was a Spanish conspiracy. If they let this continue then motogp will become more like roller derby than racing. Early in the season Jorge was way back in the pack early season. I disdain Marquez but not Jorge. I just wish he really won it and didn't have his goons pull a Tanya Harding to win it. To me Rossi is the real champion. I have no doubts about the Spanish conspiracy. What can one expect with a Spanish run series, 3 of the top 4 riders are Spanish and the final was in Spain? But Lorenzo is faster than Rossi. Almost all the time. He led the most laps and had the most wins. Rossi can't beat him most of the time straight up, so I don't have a problem with him winning. Yeah, not ant Jorge. Just very happy that Marc didn't win. Still a hollow victory since he had blockers all around him. He had many races where he was "faster" (qualifying, best lap) but Rossi ran him down and beat him. Again, how would Jorge do if Marc and Dani would have battled him to use up his tires?